Do you have a big backyard but not much to do in it? You might want to give the Eagle Series Zipline a try. Your kids will have a blast for hours and it’ll give them a workout at the same time. Looking for fun backyard games and activities to keep the kids busy? Look no further. 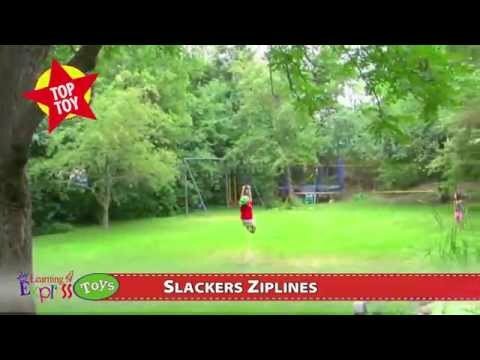 Ziplines are great gadgets to have in the backyard. Not only are they a fun way to pass the time, they’re also a great way to improve your strength. All you need is a big enough backyard and a few trees to attach it to, then you’ll be zipping down the line in no time. What’s great about the Eagle Series Zipline is that it comes with a seat, which is great when the arms get tired, and it’s fairly easy to install. It comes with a stainless steel cable, seat with an adjustable rope and a carabiner for quick installation/removal. Important Note – The kit doesn’t include a stop block, so unless you want your kid flying into a tree, I suggest you get one. They are sold separately. Or check out some of the reviews on Amazon. Some parents have found creative ways to make stop blocks with stuff around the house.